Sao Paulo may be the world's most densely populated city, but nobody's ever counted far enough to prove it. One thing is for certain, however - you never forget that this is Ayrton Senna's town, and his name is everywhere. So too are thieves, for Sao Paulo's criminal population is roughly the size of London. Three teams suffered at the hands of the darker side to Sao Paulo's chaotic existence and that is unacceptable in every sense. Interlagos is a lovely circuit with wonderful history, but that has not saved other, more illustrious venues from the Formula 1 scrap heap. Between the thrills and spills a Grand Prix happened, and the man all Brazil was pulling for was its beloved Rubinho. Barrichello had changed the red panels on his helmet for the Brazilian flag to mark the occasion and the hometown boy's gesture was greatly appreciated by his fellow Paulistas. For much of Friday, however, they were few in number. Then again there was little for them to cheer anyway as the Ferraris remained silent in their garages and, under the Marlboro men's imperious gaze, it was left to the rest of the field to see if they had got their sums right since their Malaysian thrashing. Mika Hakkinen put in some fast and aggressive-looking lappery, and in his wake Eddie Irvine was offering more Friday cheer for Jaguar. Heinz-Harald Frentzen illustrated an unusually slow start for the Jordans with a grasstracking moment at Turn 13, although his excursion was immediately bettered by Mazzacane, who spun properly at Turn 6. When the Ferraris appeared it was business as usual, though. Barrichello clipped three tenths off Hakkinen's best but that man Michael Schumacher took the initiative and brought the top time down to 1m 17.1s, spurring Hakkinen out to record a 1m 17.7s lap before spinning at Turn 8 the next time round. Meanwhile there was a moment of drama in the pits as the quality of Brazilian workmanship again came to the fore. Last season it was advertising hoardings that fell apart, this year it was a TV camera platform... adding an explanation of the damage to one of Mr. Ecclestone's cameras to the growing litany of headaches that race organizer Tamas Rohonyi had to contend with. As the opening hour drew to its hot and sticky conclusion Mika Hakkinen put McLaren back on top with a lap of 1m 17.006s as team mate David Coulthard overshot the Senna S and almost vanished off round the glorious old Curva 1. 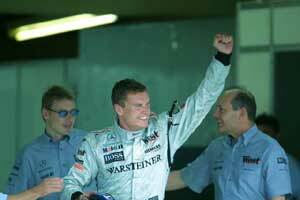 The second hour offered more encouragement for McLaren when David Coulthard took a whopping 2.5 seconds off his previous best to go clear at the head of the field on 1m 15.9s. Things were stirring at Williams too, as Ralf Schumacher put in some expert crisis management at Turn 12 to keep himself on track while Juan Pablo Montoya zipped into the 1m 16s and the sharp end of the running. Both ended the day in the top six as the team's threat continued to gather pace. Barrichello's day ended early when he pirouetted through the Senna S, his Ferrari coming to rest looking back uphill for a few anxious moments until he was hauled back to safety and he busied himself with waving to his fellow townsmen on his walk back to the pits. Coulthard then reappeared with a qualifying fuel load to take another seven tenths of a second off his best. There was nothing that either his team mate or Michael Schumacher could do to get within a second of him, Schumacher slithering through the Senna S while Hakkinen leapt from curb to curb in frustration. In fact it was Jarno Trulli who got closest of all, almost exactly a second down after another last minute dash for Jordan on this, team boss Eddie Jordan's 51st birthday. Saturday dawned with a novel twist as the Williams duo hogged the top of the timing screens, and leading the way was an exuberant Juan Pablo Montoya, the first man to dip inside Coulthard's Friday benchmark before going on alone into the 1m 13s. Ralf Schumacher is not known to relish in-house competition, and duly his laps became punctuated with puffs of Michelin's finest and even a trip over the grass at the Senna S.
Even on octagonal tires Ralf still managed to keep within two or three tenths of his team mate, which was just enough room for the two McLarens to squeeze themselves in to. Mika Hakkinen managed this feat despite overcooking - you guessed it - the Senna S. Instead of taking to the old circuit though, Hakkinen risked a display of car control unfamiliar to many in the paddock as he used the throttle to get himself out of trouble and thus swept downhill in a lusty power slide. From Friday's strength in race trim the Ferraris were a trifle muted in preparation for the Banzai runs of qualifying. Barrichello loitered among the Saubers while Schumacher equaled the best time in the first sector, murdered everyone through the twisting middle section to go two tenths up. He still crossed the line well short of the top men, as the Ferraris were unable to get into the top 10 through the speed traps, prompting a rethink on the rear wing settings. At the start of qualifying therefore it seemed that Williams was threatening to upset the apple cart, Ferrari seemingly struggling for outright pace, McLaren leaving everyone perplexed as to whether or not it had made up any ground on its red nemesis and everyone else squabbling behind. Initially, though, it was an all-Brazilian affair as Enrique Bernoldi's Arrows and the Minardi of Tarso Marques did their bit to some half-hearted tooting of air horns from Rubinho's scarlet army at Turn 4. They were swiftly deposed by Heinz-Harald Frentzen's Jordan, the shark-liveried car shooting into the 1m 14s as Luciano Burti and Eddie Irvine followed on for Jaguar. The battle of the Jags was joined by Prost's Jean Alesi and Kimi Raikkonen for Sauber but, no matter how impressive the drivers, it seemed that this was the battle for, at best, the fourth row of the grid. This was underlined by Barrichello's arrival for Ferrari, undercutting Frentzen by almost half a second as Jacques Villeneuve continued a weekend he was describing in fragrant terms by throwing his BAR at the curb inside Turn 8 hard enough to spin his first run away. The real action began when the Williamses turned out, but Juan Pablo Montoya fell asleep during Turn 11 and was extremely lucky not be flipped over by the rough and ready gravel trap. Mind you Patrick Head's war dance of disappointment suggested that the Colombian's chances of being inverted remained high as the team put finishing touches to the T-car, which was already set up for him in Latin American climes. In contrast Ralf Schumacher logged an impressive 1m 14.174s for his first run but this was only good enough for second place. Big brother Michael had just got in before him with a 14.034 without breaking sweat, the Ferrari clearly now fettled for qualifying and its occupant meaning business. The two McLarens had their first runs blighted when Montoya went off, but when Hakkinen came back out he was bang on the pace courtesy of the McLaren's straight line pace in the first and third sectors and slotted into second, just .068 seconds behind pole, with Coulthard taking fourth shortly afterwards. DC was swiftly deposed by Montoya, however, who bounced off the banking onto the pit straight shedding a chunk of the undertray that was plucked off by the asphalt as the Jordans vied for seventh place - Trulli shading Frentzen by .009s. Michael Schumacher reappeared having aborted his second run, feeling it wasn't up to the required standard, and when he got it right the time was a handsome 1m 13.784s which was enough to sew up pole there and then. Behind him though the competition was almost ludicrously close, and following their third runs a tenth of a second was all that stood between Ralf Schumacher's Williams in second and Rubens Barrichello's Ferrari in sixth, with Montoya and the McLarens squashed between them. The gap behind them was all but half a second, putting Williams clearly in the big league in terms of pace. Jordan remained on top of the second division with, this time round, Sauber just a couple of tenths behind with Heidfeld beating Raikkonen to ninth. Behind them were the BARs, Panis again outpacing Villeneuve, the Jaguars, Burti getting up on Irvine's pace at last, Jean Alesi flattering the frankly bewildering Prost in 15th ahead of the Arrows twins and the battle for last between Mazzacane, the Minardis and the Benettons in which Fernando Alonso starred for Minardi. Meanwhile in another world Michael Schumacher looked forward to a clear view of the first corner for the eighth race in succession. When asked if he had any problems at all he grinned. "Not really... sorry." SUNDAY dawned brightly for Sao Paulo and the Ferrari team made hay while the sun shone to be comprehensively fastest in the morning warm-up, half a second faster than Mika Hakkinen and a glut of Mercedes, BMW and Honda powered cars within a few tenths of one another. The Brazilians finally arrived to urge Rubinho to be heroic for them. With the thunderous chanting led by a positively rabid MC, Barrichello's every appearance outside the pits threatened tinnitus for miles around as the phenomenally beautiful and phenomenally naked grid girls marked their turf. With minutes remaining, the cars zipped in and out of the pits on their installation laps - all except that of Barrichello, who parked-up when his Ferrari lost all oil pressure. The anxiety which swept the grandstands was not, seemingly, shared in the Ferrari pit as they readied Schumacher's T-car for the hometown hero. Barrichello never stopped running, guaranteeing that his wish to give a 'sweaty helmet' to one lucky spectator would come true even if he failed to reach the grid, and that paragon of sportsmanship Mika Hakkinen was there to give Rubens an encouraging slap of hands before Rubens dived into the spare Ferrari. The MC almost exploded. Finally the field set off on its green flag lap, although Eddie Irvine almost stayed on his 13th slot on the grid and the last-minute ministrations of his team earned him a 10-second stop and go penalty taken on lap 6. One by one the lights went on, then off, and Michael Schumacher hooked up like never before, his brilliant start further flattered by his little brothers disastrous one and the stationary McLaren of Mika Hakkinen. "The season's starting for me," Hakkinen had said beforehand, but it was a false dawn as his clutch "behaved very aggressively" and Mika walked away from his car. Unfortunately he was so upset that he forgot to put the steering wheel back on properly, leaving marshals fighting a losing battle to move the stricken McLaren and resulting in the appearance of the Safety Car - and a $5,000 fine for Mika just to complete his nightmare day. Behind the Safety Car the winners and losers of the Hakkinen-inspired chaos at the start were clear. Principal among them was Juan Pablo Montoya, whose Williams had rocketed past Ralf Schumacher's sister car to take up second place behind the leading Ferrari. In fact Ralf's start was so shocking that he had slid down behind David Coulthard's McLaren after a bold move from the Scot inside Turn 1, only to be pushed further back by Jarno Trulli's Jordan, making him the biggest loser when order was restored. In fact only the Sauber boys were non-movers in the order and the biggest winner was Jacques Villeneuve, who made up four places off the line and set about reminding everyone that he was once deservedly world champion. That was in a Williams however, and when the Safety Car completed its single lap the Grove team's latest star made best use of his Safety Car experience from Champ Cars and the best use of all BMWs prodigious power to get the drop on Schumacher going into the Senna S.
As Montoya muscled inside the Ferrari the grandstands, the press room and living rooms across the world erupted. He hung in there too, scuffing rubber with the Ferrari and forcing it onto the grass as the man with three world championships to his name found a man in his third Grand Prix brushing him aside. "He pushed me wide on the exit, which is pretty normal racing, we touched a bit but no problem with that," Schumacher said softly afterwards, but F1's grand intimidator was well and truly rattled. So too, seemingly, was his car. As he gave chase to the impudent Colombian, Schumacher was repeatedly forced to rescue himself from lurid moments. Outwardly the F2001 looked undamaged, but as the first few drops of rain fell it was clear that this was not the same car which skated over the waterlogged Sepang circuit two weeks before as Montoya eked out his lead tenth by tenth. No sooner had this drama occurred however than another followed of an altogether less welcome variety. Ralf Schumacher was caught napping by Heinz-Harald Frentzen after the Safety Car pulled off, with the two of them joined by Rubens Barrichello as they jockeyed for position. Under braking the Ferrari hit the Williams from behind, sending Barrichello's left front wheel into orbit, Schumacher spinning to a halt sans rear wing and the Ferrari careening into the tire wall. Schumacher crawled back to the pits but Rubinho's hopes of glory in Brazil came to an end for the seventh year in a row. "I was behind Ralf when he suddenly changed line," said a dazed Barrichello. "It was probably to pass another car and he braked in front of me. I did not expect this and a collision was inevitable." Patrick Head was robust in defense of his driver, however, whom had a new rear wing fitted and set about becoming the fastest man on the circuit. "I think it's well known in any situation on the road that the responsibility is with the driver behind," he fumed. "If he runs into the car in front he pays for the damage to both cars." The FIA stewards lectured both men. The gap between Schumacher and Montoya meanwhile evened out to around 0.7 seconds, with Coulthard hanging on grimly another second down the road, as the brooding Brazilian sky decided whether of not to unleash a deluge. From the rear-facing camera on Montoya's car Schumacher loomed through the twisting middle sector of the lap but seemed to select reverse whenever the road straightened out. The Williams plan hinged on using its Michelin tires to good effect against the known quantity of the Bridgestones on the Ferrari. The plan was to go for as long a first stint as possible and single stop, and when Schumacher swung in on lap 25 it was clear that he was on a two-stop strategy, effectively handing the race to Montoya should all be well. The Ferrari was stationary for a shade over nine seconds and reappeared in fifth place as Montoya began banging in a series of fastest laps for which Schumacher, amazingly, had no answer. On lap 31 Montoya put in his fastest lap of all - a 1m 16.593s - to go 26 seconds clear of Schumacher, and although he went no faster the gap was up to well over 30 seconds as he started lap 39 with the Williams men starting to think about a pit stop - which never came. On the run into Turn 4 Montoya lapped Jos Verstappen's Arrows, took his line... and was hit from the rear with enough force to send both cars out of the race, Verstappen's car flipping into a wheelie as it smashed the back of the Williams apart under the violence of the impact. Against all expectations Verstappen found himself playing a role in the outcome of the race, but Montoya miraculously remained upbeat. "It was going to be one of the best days of my life, but unluckily it became a bad one," he said. "Better things will come." Of that Sir Frank Williams was in no doubt, even managing a wry smile, encouraged that his and the team's wilderness years seem almost over. This left David Coulthard in the lead as the McLaren men prepared for his single scheduled stop on lap 40, his tires about as slick as the FIA allows, with Schumacher second and, way, way back, the two Jordans squabbling over third. He pitted with 30 seconds in hand and used every one of them, slicing out in front of Schumacher just a few tenths of a second ahead as the skies made up their mind to swap the occasional spot of rain for a light drizzle and finally a full-scale deluge on lap 46. Schumacher had survived enough lurid moments by then and instantly ducked in for a set of those magical intermediate Bridgestones - which had served him so well in Malaysia. Coulthard stayed out, splashing uncertainly round for another lap and seemingly throwing away his chances with yet another ill-timed stop. And yet Schumacher's was a scheduled second stop, and Coulthard was in and out as fast as the intermediates could be fitted. He rejoined within striking distance of Schumacher, and on lap 48 the Ferrari which had lapped five seconds a lap faster than the McLaren in these conditions two weeks before slewed to a halt on Turn 4, allowing Coulthard to latch onto the leader as he recovered. Coming off the banking onto the main straight Coulthard got a run on the Ferrari and, with Marques wandering around in front of them, dived inside both Schumacher and Ferrari into the Senna S in a mirror of Mika Hakkinen's celebrated move at Spa last year. In truth however he was showboating, the Ferrari had no response to the McLaren for some inexplicable reason and from then on Coulthard built his lead with smooth, measured driving to cross the line 16 seconds clear. "I™m really overjoyed. This is the best feeling I™ve had from a Grand Prix victory," said the Scot, who was ecstatically lifted off his feet by the team, danced a bizarre little dance on the podium and was clearly enjoying his unexpected victory. "We decided earlier that there might be a change in the weather so we would make a little bit of a compromise on the setup to make sure I was in good shape for the damp. That didn™t give me too much trouble at the beginning of the race and once it was damp the car was working very well." Behind him Michael Schumacher, beaten by strategy and a slice of bad luck, was a study in petulance, and when asked to describe what was amiss with his car the German grew increasingly hostile. "You would like me to answer this, honestly?" he said. "I just don™t like to go into detail with you my setup! It™s pretty easy!" Alongside them on the podium was Nick Heidfeld, in a morale-boosting finish for Peter Sauber's team before the finances to develop the C20 run short. It was not, however, a dazzling drive but as the Jordans fell by the wayside with oversteer for Trulli and a misfire for Frentzen, the Jaguars vanished with Irvine spinning in the rain and Burti getting a water leak and the BARs were hobbled by a total of five minutes in the pits, ruining superb drives by Villeneuve and particularly Panis which helped Benetton on towards an unexpected point. The perennially unlucky Coulthard seems now to have the cards falling his way, so that even in a still-unsorted car he now sits only six points behind Schumacher for all the German's recent achievements. Yet the undoubted star of the day, however, is resolutely last on the points table as Formula 1 prepares to go home to Europe - and to circuits more familiar to him - having logged his third early exit in as many races. In a weekend when some senior figures were claiming that the sport needed more Hollywood-style appeal, Juan Pablo Montoya's performance was like the entrance of the leading man in a gung-ho blockbuster drawling "I'm here, general. You can start the war now."